Whatever the season, a new novel by bestselling author Anne Perry is always a wonderful gift, but her holiday novels are particularly special treats, and A Christmas Beginning is a deeply felt story of passion and redemption. Superintendent Runcorn of Scotland Yard is spending Christmas on the wild and beautiful island of Anglesey off the north coast of Wales. On one of his solitary strolls, the lonely bachelor stumbles upon a lifeless body in the village churchyard. The unfortunate victim is quickly identified as Olivia Costain, the local vicar’s younger sister. In life, Olivia had been a free spirit, full of charm and grace. For Runcorn, she is a haunting reminder of Melisande Ewart, the one woman he’s never been able to forget. Everyone on Anglesey is quick to insist that only a stranger to the island could have committed the heinous crime. But the evidence proves otherwise, and the unpopular work of discovering who among Olivia’s friends and neighbors–and numerous eligible suitors–is a ruthless killer falls to Runcorn. A plebian outsider in the drawing rooms of the snobbish local gentry, Runcorn never dreams that the key that will unlock the secrets of Olivia’s life and death may also, miraculously, open the door to a new future for himself. Last December I was struggling to find a historical fiction novel that had a good mystery and involved Christmas in some form. Goodreads kept recommending Anne Perry, and I picked up a few of her novels at the local library. Sadly, there was always something that had me putting the books down by the end of the first chapter. I just couldn’t embrace the characters, or the mystery didn’t intrigue me. I finally picked up the audio version of A Christmas Beginning and it satisfied my Christmas mystery needs. I won’t provide a summary of the story as the synopsis above does a pretty good job, but I do want to start the review by saying that I wasn’t a huge fan of A Christmas Beginning. With that being said, I am going to state the positives first. I really liked Superintendent Runcorn. I found his gruff personality, subtle kindness, and struggles with self confidence endearing and I would probably love a tv show staring him. He wasn’t perfect, and that’s is what kept me reading. I also enjoyed the murder mystery. The brutality of Olivia Costain’s murder was shocking and stark for the setting, and it may seem morbid, but it was perfect. I was glued to the investigation because 1. I had to know why this murder happened the way it did and 2. I wanted Runcorn to succeed so badly. 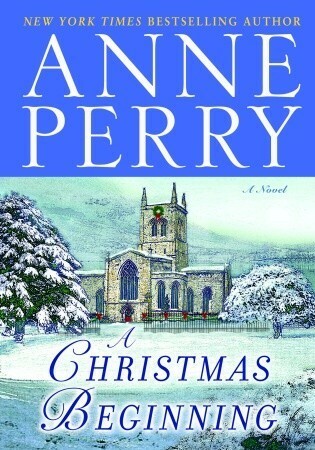 Will I be reading another Anne Perry Christmas story this December? Nope. But, I do want to hear from those who love this author and her stories as she is such a staple in the historical fiction community. Please let me know your recommendations, because I loved Runcorn enough to maybe give Perry another try.